The United States Congress designated the Cheaha Wilderness (map) in 1983 and it now has a total of 7,400 acres. All of this wilderness is located in Alabama and is managed by the Forest Service. From the stone tower on the summit of Cheaha Mountain, Alabama's highest point at 2,407 feet, a dense second-growth woodland stretches south across Cheaha State Park and into Cheaha Wilderness, Talladega National Forest. For a scenic peek over the area, an asphalt road leads to the top of the mountain, off of Alabama Highway 281, the Talladega Scenic Drive. Best known for its elevated terrain and overlooks with panoramic views, of east-central Alabama. The Cheaha Wilderness attracts hikers to the Pinhoti National Recreation Trail, Alabama's longest walking path. This stretch of the trail runs from northeast to southwest across the entire Cheaha Wilderness, a distance of 7.8 miles. Primarily following a ridge system through Talladega National Forest, the Pinhoti crosses the top of Cheaha Mountain. To the Creek Indians pinhoti means "turkey's home." Indeed, wild turkeys are common trail companions (as are white-tailed deer), and this is the only trail that is marked in the Wilderness Area. It is marked with a blue blaze. From the Lake Chinnabee Recreation Area, the Chinnabee Silent Trail leads into the Wilderness, just east of the lake, and joins with two established trails at about 5.3 miles: Pinhoti, and Odom Scout Trails. A shelter is located approximately midway to the trail juncture along the Chinnabee Silent Trail, outside of the Cheaha Wilderness. The Odom Scout Trail runs almost due south from the juncture, covering approximately 4 miles of the area. The Cave Creek Trail starts at the Cheaha Trailhead at Cheaha State Park and goes into the Wilderness heading south; it is approximately 3.3 miles long and ends at the Nubbin Creek Trail in the middle of the Wilderness. The Nubbin Creek Trail starts off of Co. Road 61 in Clay County, heads northwest into the Wilderness then turns to the southwest and intersects with the Odum Scout Trail, approximately one mile from the intersection of the Chinnabee Silent, Pinhoti and Odum Scout Trails. The Nubin Creek Trail is 4 miles in length. Wilderness camping and campfires are allowed in the Cheaha Wilderness, fire closures will be posted at trailheads during high fire periods. 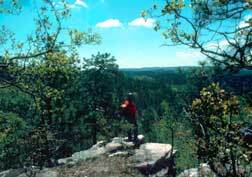 Hunting is also permitted during hunting season so hikers are advised to wear bright orange on their outer garments. Near the edge of the Cheaha Wilderness, you'll find the Turnipseed Campground for picnicking and camping. Turnipseed is located where the Chinnabee Silent Trail, and the Talladega Scenic Drive, Hwy. 281intersection. Campsites with hookups, a motel, and rental cabins can be found in the adjacent Cheaha State Park. Planning to Visit the Cheaha Wilderness? How to follow the seven standard Leave No Trace principles differs in different parts of the country (desert vs. Rocky Mountains). Click on any of the principles listed below to learn more about how they apply in the Cheaha Wilderness.